Few people would admit that one of 2008’s best pure death metal albums came from a humorous side-project of Municipal Waste’s Landphil, but Tube Of The Resinated masked its terrific music beneath marijuana-obsessed wordplay that doubtless put more than a few people off. 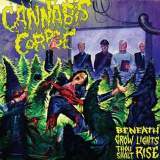 Be sure not to make the same mistake about Cannabis Corpse’s third album, on the surface even more ridiculous but under the cover full of the sort of death metal anthems that we addicts are often left scouring for in vain. The band may be better known as the death metal group that got a cameo in hilarious political satire In The Loop, but they deserve to be known for their music. More technical and with even better songwriting than the previous album, Beneath Grow Lights Thou Shalt Rise is a killer, killer album. Somewhere between Cannibal Corpse, Morbid Angel and Deicide, the likes of Lunatic Of Pot’s Creation and Blame It On Bud may verbally reference the latter but are far more broad in influence, featuring everything from technical bass noodles to melodic guitar hooks.